Joon is back and we got some great pics and a little video from his trip down to Panama. Enjoy! Lod, Art, Ruben and Joon just finished up prepping Joon’s S13.5 for the Formula D drift demo and stunt show in Panama City, Panama on Feburary 5th. 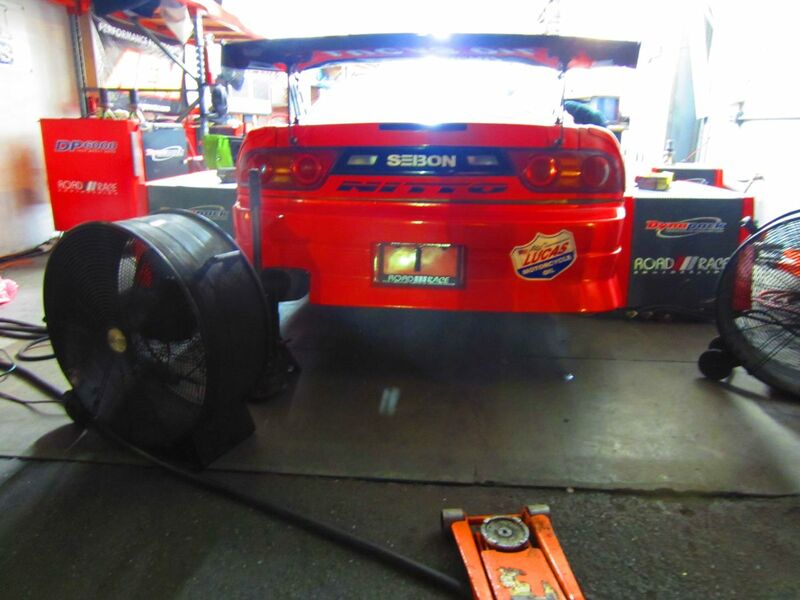 They added some heat protection around the turbo and swapped Joon’s MotoIQ grip road racing setup back to drift. 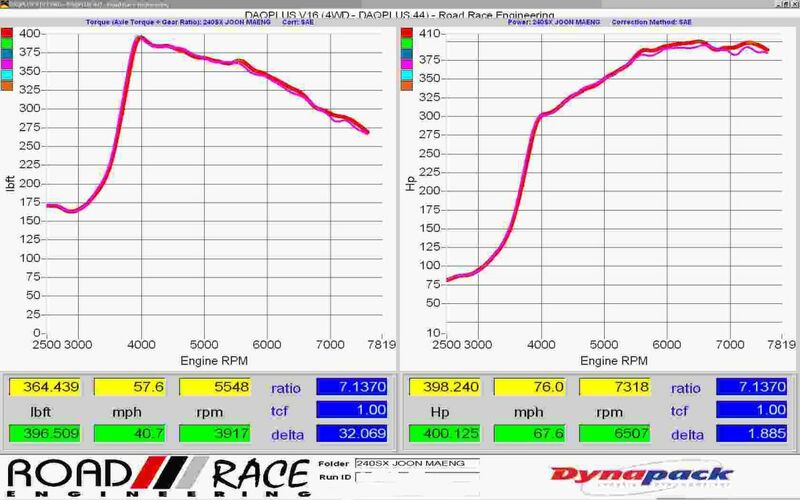 Lod put the 240 turbo on the dyno for a clean up tune with the AEM EMS and knocked out a solid 400 whp/375 ft lbs of torque on the RRE Dynapack dyno on 91 octane. 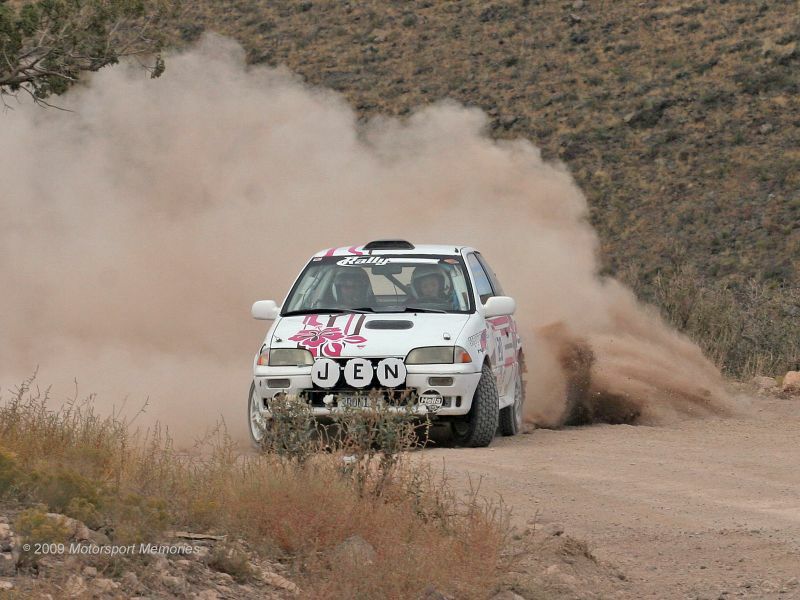 Jen got her Suzuki Swift all patched up after the roll at the Gorman Ridge Rally last month. The car headed out of here and off to Arizona last Thursday. 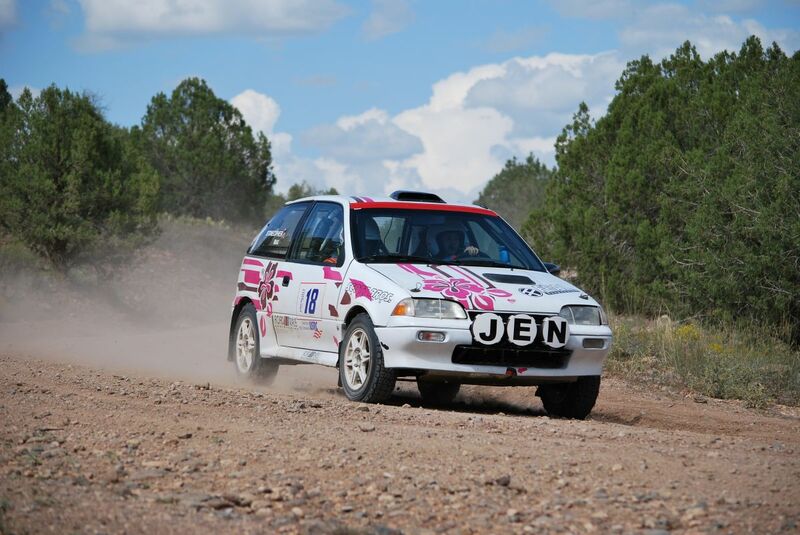 She finished 2nd place in Performance Stock for the Friday night rally. 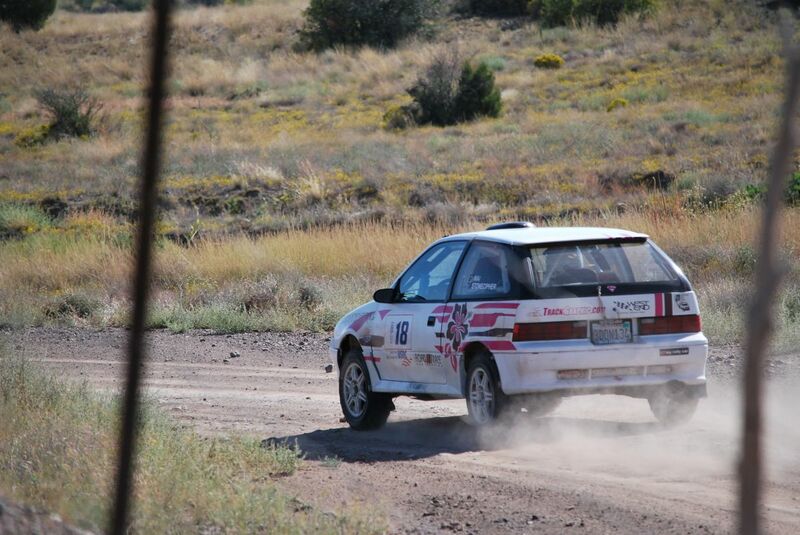 On Saturday she had to deal with a blown rear strut but here competition for the championship John Black in the Ford Ranger had more problems. 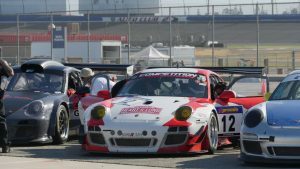 She ended up with 1st place in P-Stock on Saturday and enough points to get the Performance Stock California Rally Series Championship. Congratulations Jen! 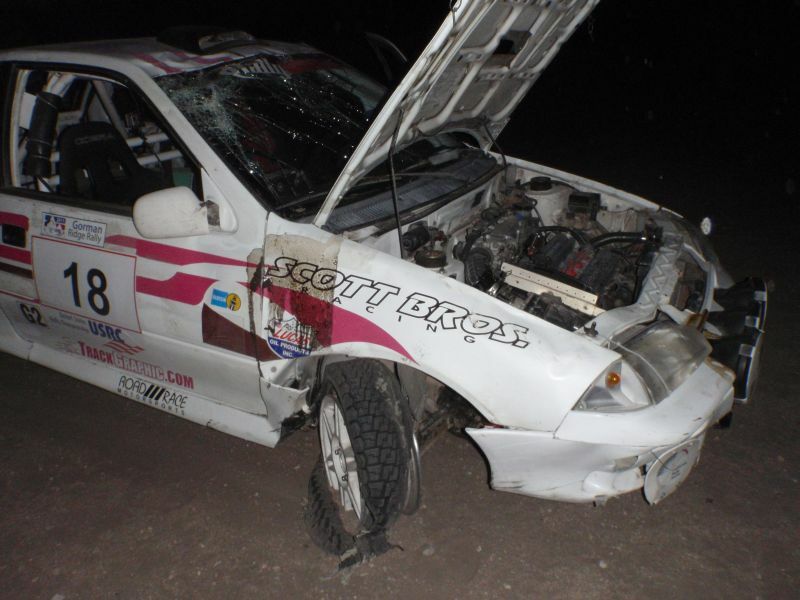 This is what got me into AWD turbo cars… fixing bent rally cars. 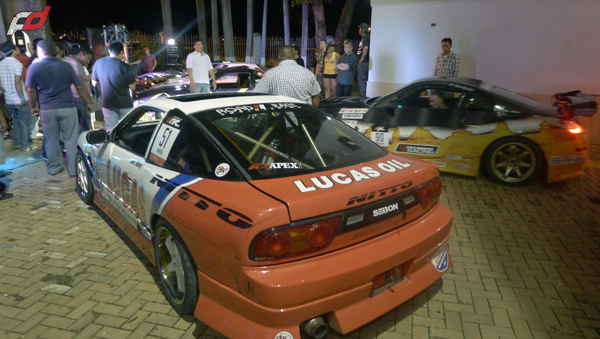 Bent rally cars led to AWD Eclipses which led to EVOs and the rest is history. But bent rally cars still follow me around. 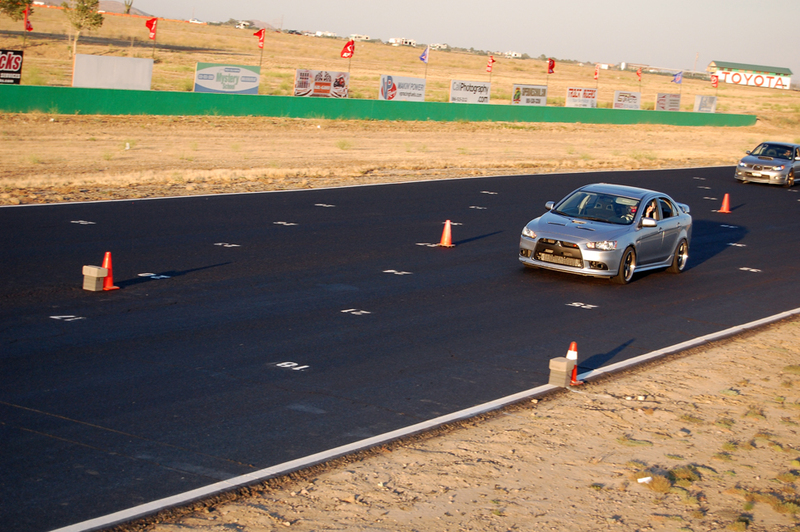 We got to know the guys at APD Motorsports through our work at the Redline Track Events/MotoIQ race series. 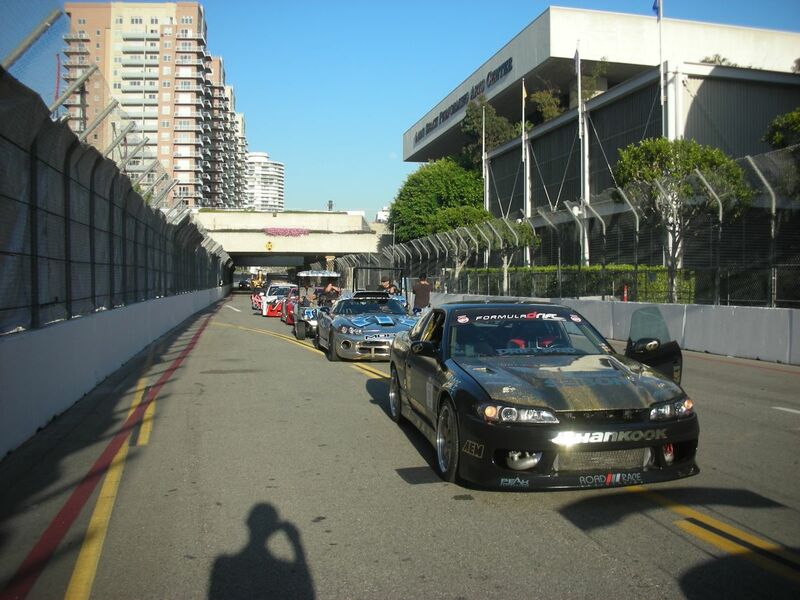 Our Dynapack AWD dyno is the official dyno for the MotoIQ Pacific Tuner Car Championship road racing series there. 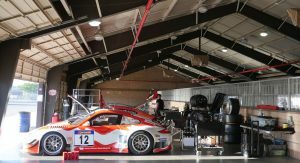 The classes are run on a strict power to weight ratio and RTE needed a consistent dyno that could be taken to the race track. 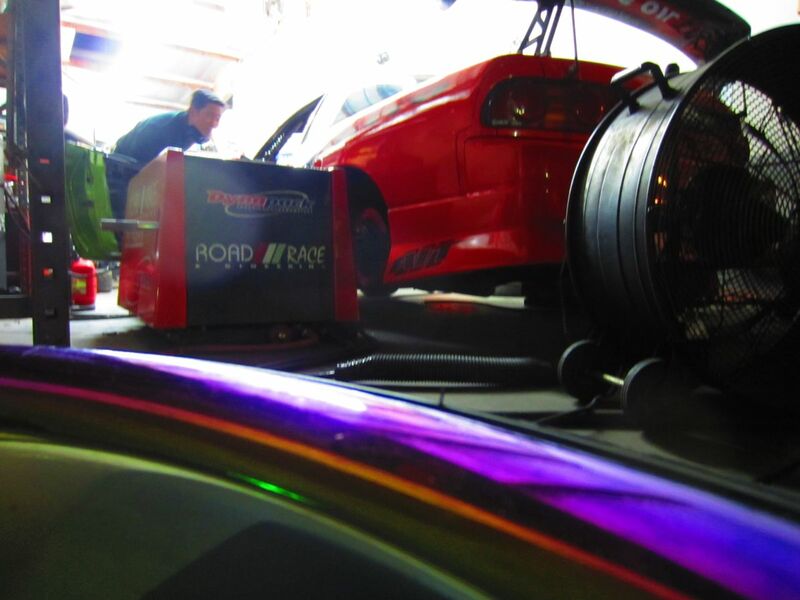 We had a good baseline dyno for the APD Acura from when they ran the first race in June. While based on the east coast, they had some work done on the car here in California. 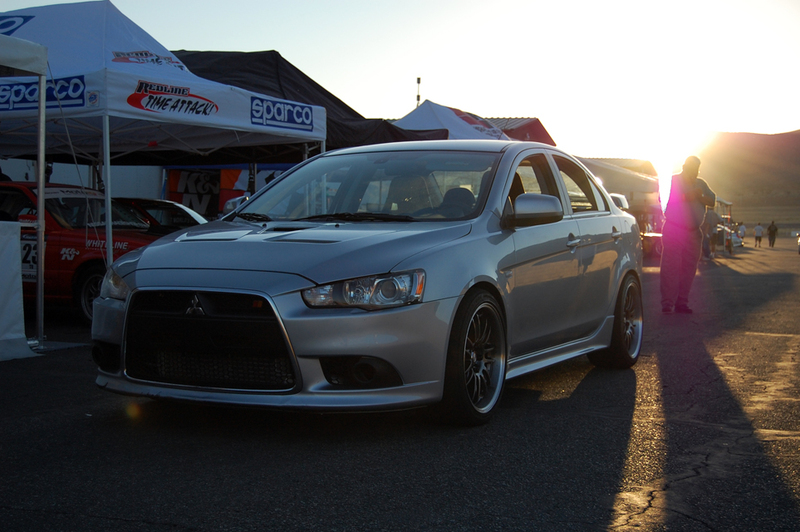 They installed cams and had the car tuned by our friends at AEM using the AEM Series 2 EMS. 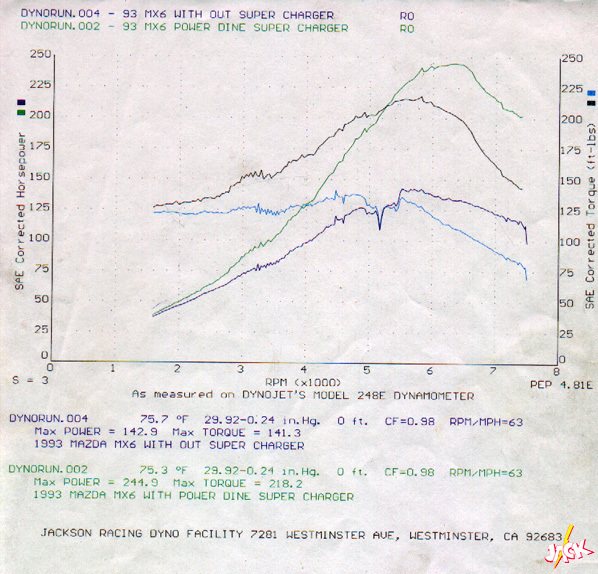 Since our dyno is the only local dyno with good “before” data, they stopped by to run the car again and see what the gains were. 39 hp at the wheels is very nice for the modifications they did! OMGWTF? RRE Works on Miatas? 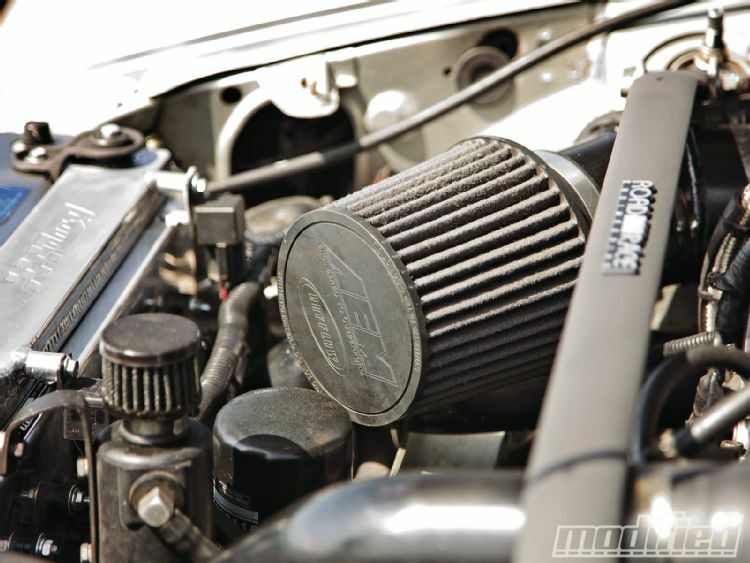 Mike @ RRE tuned the AEM EMS Series 2 ECU on Jeff Abbott’s FD Miata. It is not only DSMs and EVOs all day every day. 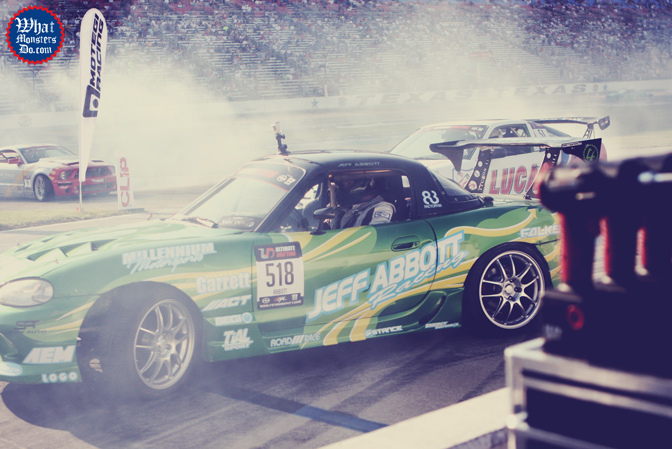 There are some weird things going on at RRE like JOON MAENG’S S13 and JEFF ABBOTT’S Miata. Come by the shop and see what is going on!! Everyone who is anyone reads MOTORMAVENS! You are in your favorite PJs sipping some coffee and you see a MIATA and ask, IS that an RRE sticker on that MIATA?? Why yes, that is an RRE sticker. Get out of your PJs and come to an FD event to support these fools!! Pretty much everything has been said about intake and exhaust systems by now. By replacing the factory-equipped units, one hopes to increase airflow and decrease exhaust backpressure, allowing the engine to churn out some extra ponies for your enjoyment. Sounds simple enough, and it usually is. However, some cars, such as the Nissan 370Z, are extremely finicky when airflow is altered, especially around the MAF sensor area. 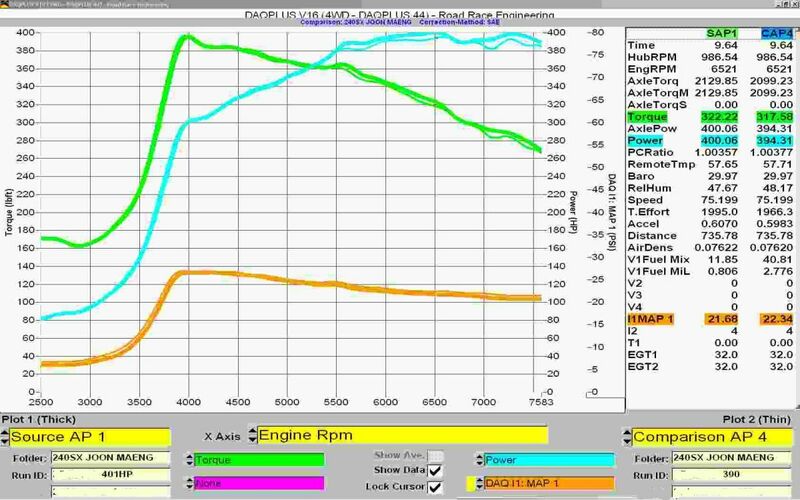 The ECU doesn’t like different readings, and the usual result is less horsepower than you started with. 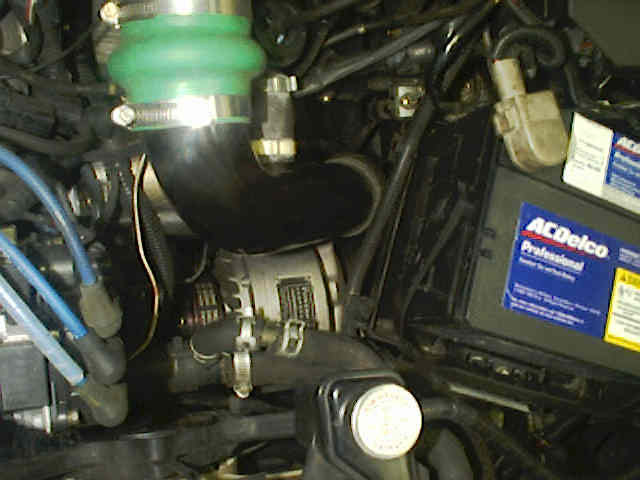 AEM has gone to great lengths to remedy this problem by introducing electronic tuning to its intake systems. 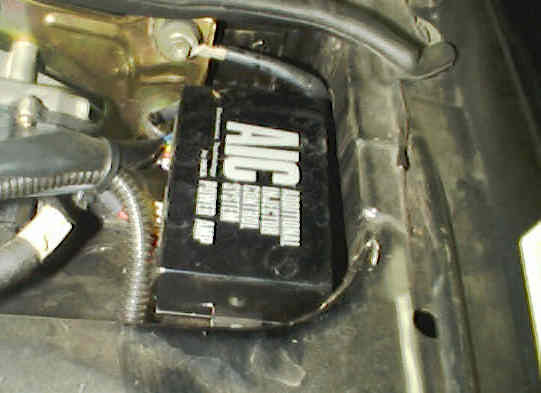 A black box is connected to the MAF sensor and ensures that the ECU still sees the airflow counts that are within factory calibration, while the larger AEM intake tubes provide more airflow into the engine, resulting in more power. It’s a great and, best of all, safe solution for adding intakes to your 370Z. The Nismo Z already comes with a great flowing exhaust system, but MagnaFlow set out to add more power and sound with its stainless steel dual 2.5-inch exhaust system. Using all mandrel-bent piping and a high-flow muffler, MagnaFlow’s exhaust system will wake up your Z from its sedate-sounding stock exhaust sound to a much more lively note. With our Nismo Z in stock form, it belted out a solid 303 whp and 249 ft-lbs of torque on Road Race Engineering’s dynapack dyno. On went the MagnaFlow exhaust system, which is a very straightforward and simple install. 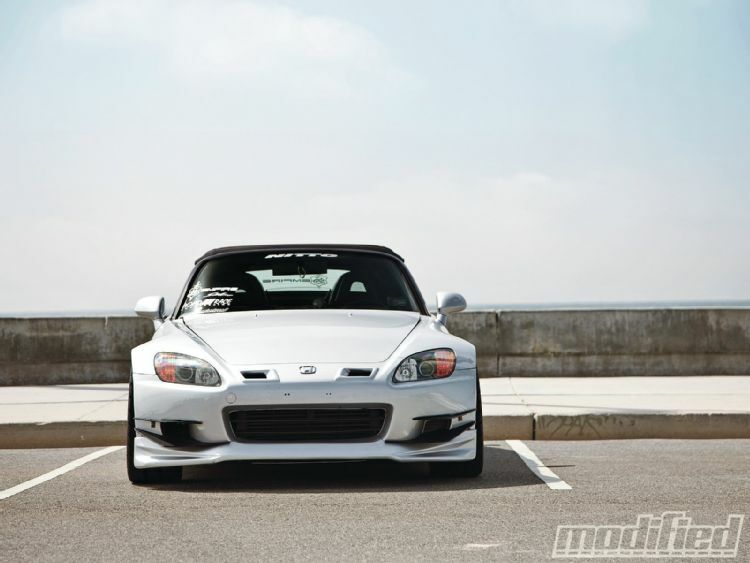 Art’s personal S2000 came out this month in Modified Magazine. Art is a fabricator here @ RRE and has been slowly working on this car for the last couple years. Congratulations on the article Art! Everyone has hobbies when they’re growing up. For some, it’s playing sports like baseball or football. Other people collect cards or play video games, while another group prefers putting things together with their own two hands. 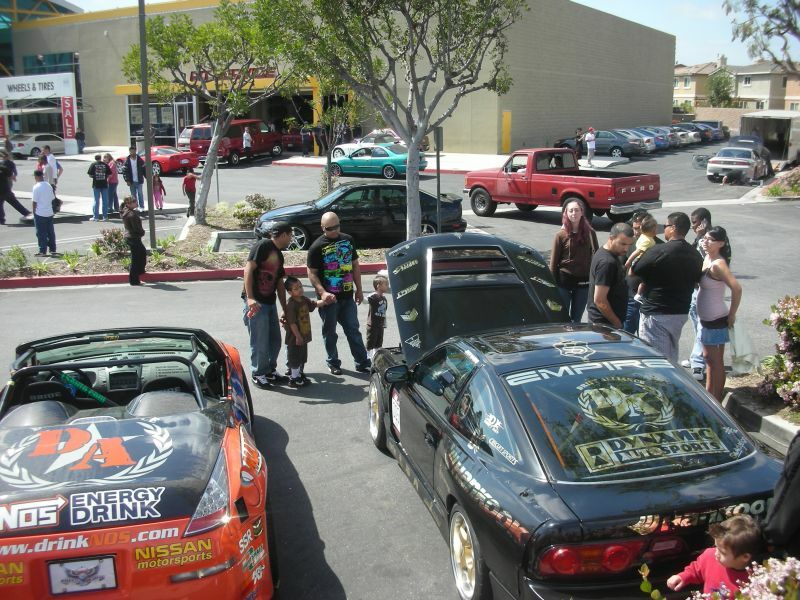 Most car guys (and gals) are in that faction and are introduced to building models or seeing cool cars that family or friends have built at a fairly young age. Art Thavilyati is one of these people, and he first became enamored with motors when his cousin picked up a Honda Prelude and began tinkering around trying to make it faster. “I’ve been into cars since I was a kid,” Art says. 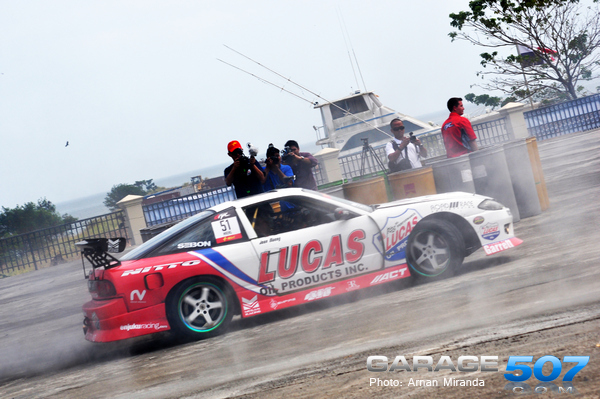 “I was introduced to it by my older cousin, who had a nicely fixed-up Prelude. From then on, I met a friend who always worked on his own cars. Since I was about 15 years old, we worked together on his cars in his backyard — he would teach me as we went.” If only we could all be so lucky, right? Having so much hands-on experience through his teen years has taught Art a lot, and he has put it to good use on his AP1 S2000. “We were always into Hondas,” Art says. “So when the ‘ultimate Honda’ came out in ’99–00, the S2000, I knew I had to own one some day.” We remember this feeling and can completely relate to Art’s desire to own one of the most well-rounded sports cars of the modern era. 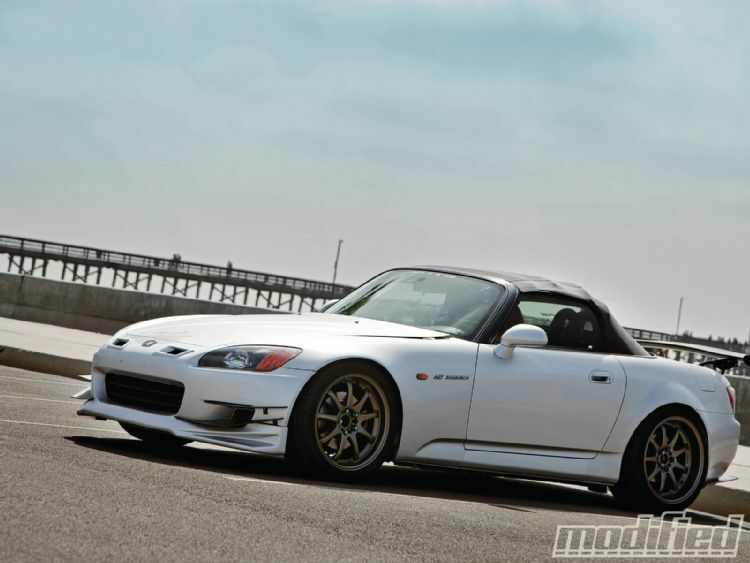 The S2000 has been widely accepted by the tuning community because of its amazingly well-balanced chassis and nearly perfect NA motor. The engineers over at Honda really did something right when they designed the F20C. 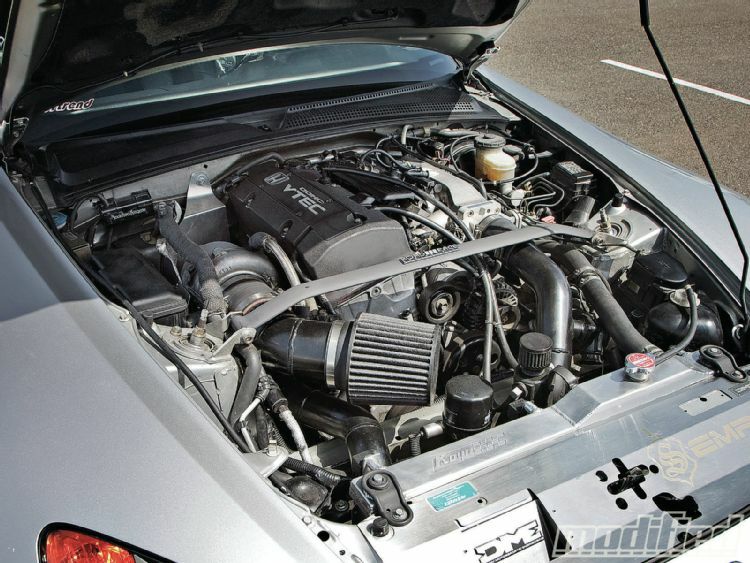 After more than a decade of trial and error, the general consensus is that if you want to make more power out of this motor, there’s really only one option: forced induction. 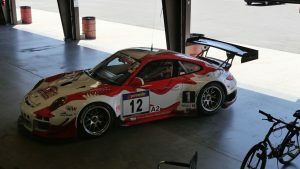 For Art, this is no problem, seeing as he works as a tech at Road Race Engineering, a Southern California speed shop that specializes in Mitsubishi and Nissan cars. The turbo kit Art has pieced together for his S2K is a bit of a unique setup. Opting to use a top-mounted GT3076 and a log-type manifold, this interesting setup feeds boost into a built and fortified bottom end. 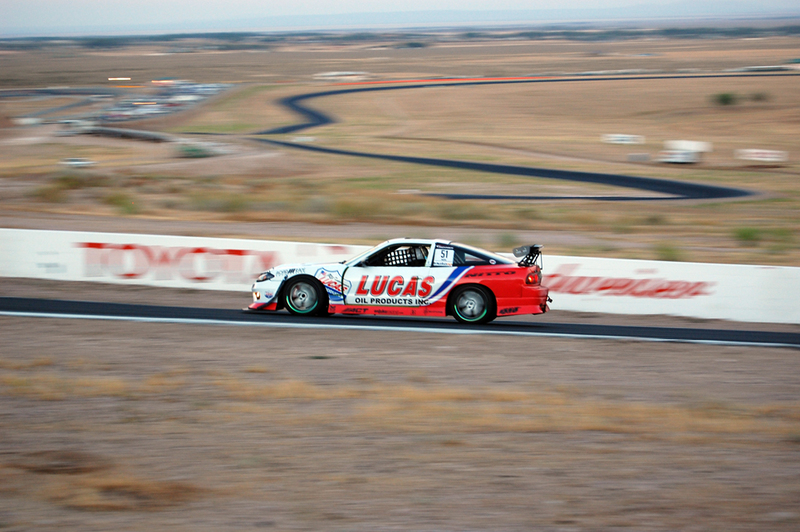 A custom catch can and intercooler piping add a nice touch to the homemade feel, and the resulting 403 hp means Art’s car can certainly scoot its way around town or the track. 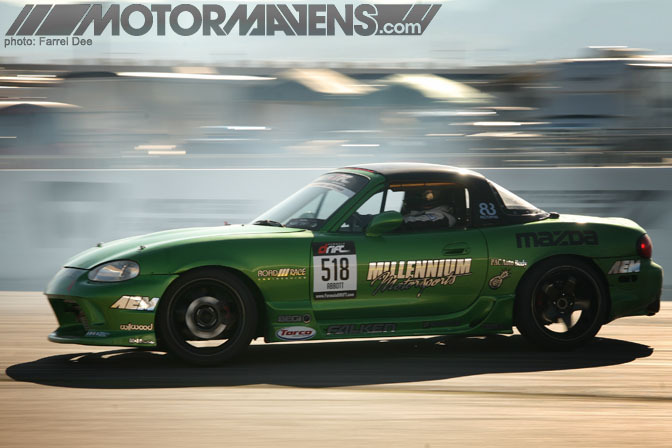 A set of JIC adjustable coilovers keep the S2K planted, with the help of sticky Nitto NT05 tires. The rolling stock of choice is a big set of Work XD-9 wheels, sized at 18×9 inches up front and 18×10 inches in the rear. 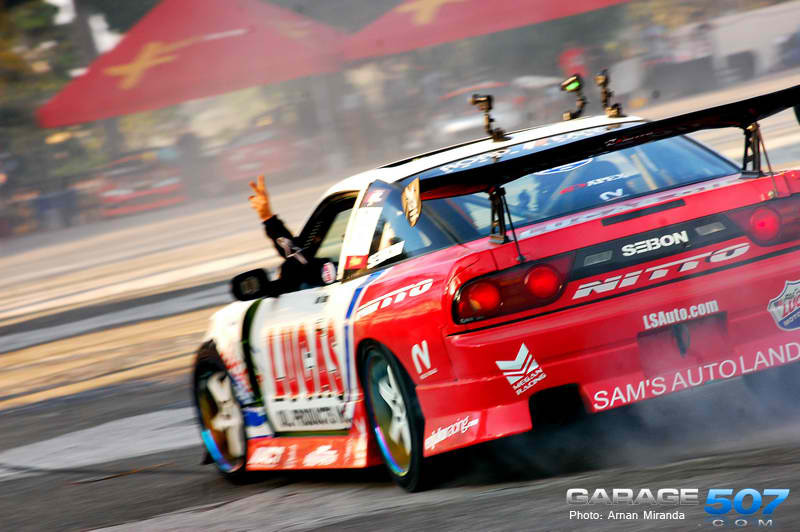 RRE’s Formula D driver Joon Maeng took a couple days off to shoot a commercial for his sponsor Lucas Oil at Irwindale Speedway last month. 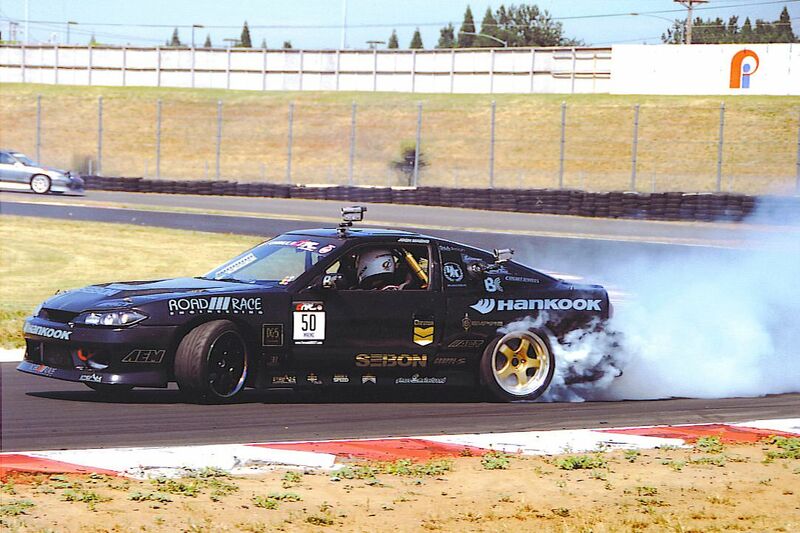 This is his back up/demo S13.5 with the SR20 turbo motor. Here is the video. 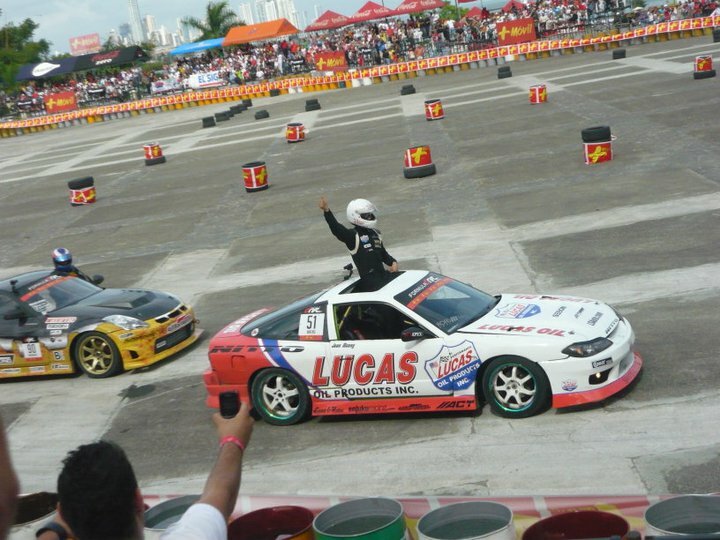 Our favorite Formula D driver Joon Maeng got invited to the Extreme Drift demonstration in Panama. Joon, Lod and Art here prepped the 240 here at the shop back in early January for the long trip. Formula D shipped the cars down there by ship in containers. 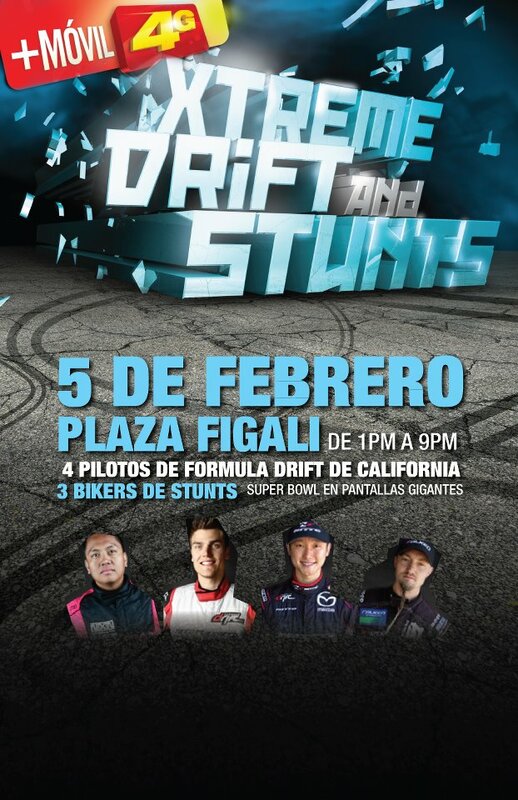 The drifting demo was in the main downtown plaza. Here are a couple videos. Enjoy! 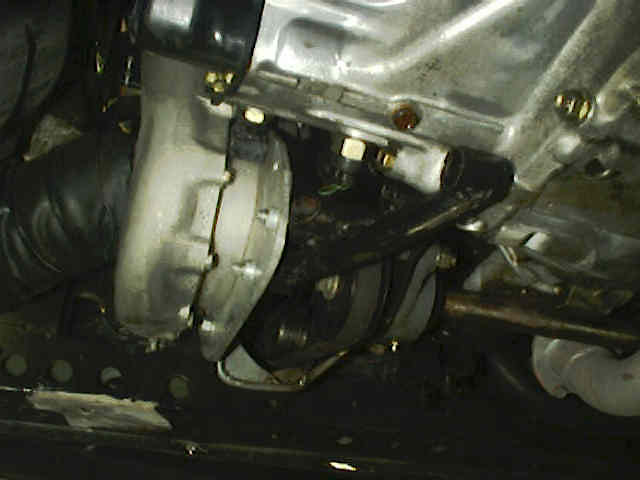 There is a good reason we dont work on MR2s :-P God just never intended for that motor to be in that little hole! Bryce has been tuning for a while here @ RRE. He is just now up on all the latest XML for Little Tikes, Fisher Price and Step-2 vehicles. Hit him up if you want to set up an appointment. Afternoons are out for naptime of course. Here is a video of him getting the last power out of the Cozy Coupe. The Dynapack lets him check part throttle and get the fuel trims all dialed in nicely. Lydia’s 85 Ford Crown Victoria was on its way to the crusher. It had led a long and productive life taking grandmas to the market and was continually needing one more $500 repair to this otherwise ok condition $500 car. Gas prices being at $4.00 a galon too didnt help. After considerable thought, we held a raffle/pool on So Cal EVO to guess the time it would live at full throttle with no oil and no coolant on the dyno. Winning time 7 minutes and 29 seconds! 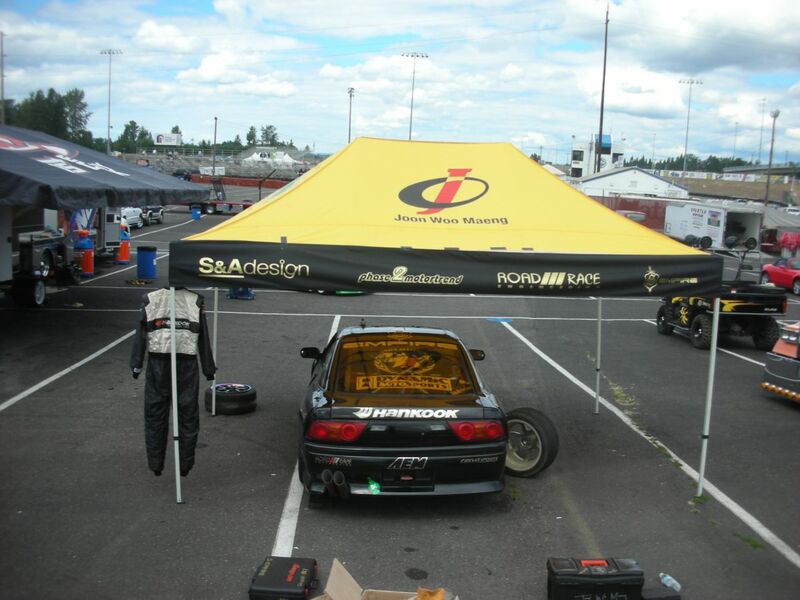 The S-Empire/RRE Nissan S13.5 ran with Formula D at Portland International Raceway from July 25th-27th. Joon ran with Chris Forsberg, Tony Angelo, and JR Gittens. On Saturday Joon gave a ride along to one of the P.I.R. staff and she had a good feedback. It was a successful event! 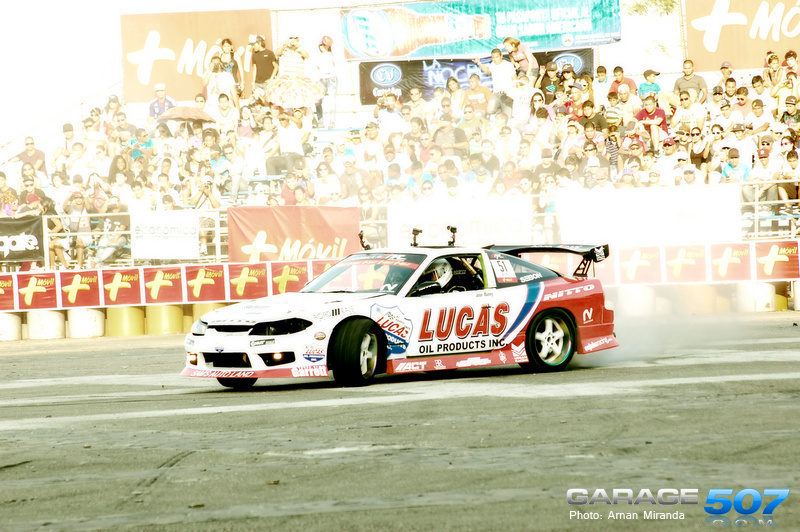 Joon will be attending the Formula Drift Monterrey Mexico Competition next with the S13.5 on August 22nd-23rd. 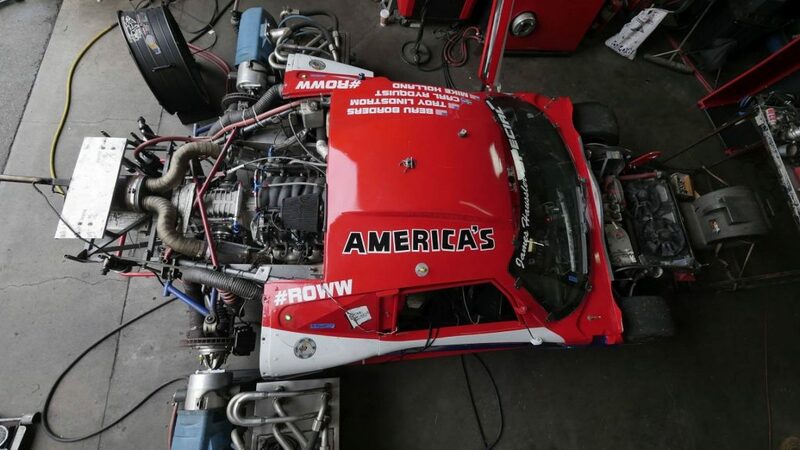 We are upgrading the turbo and getting prepared to have a powerful and reliable drift car for the Formula Drift Mexico event. 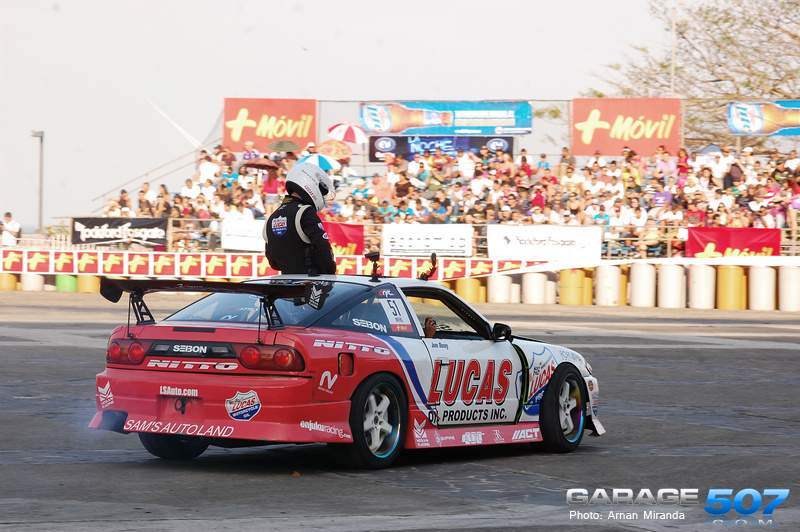 The S13.5 will be loading in the F.D. Rig on August 13th. 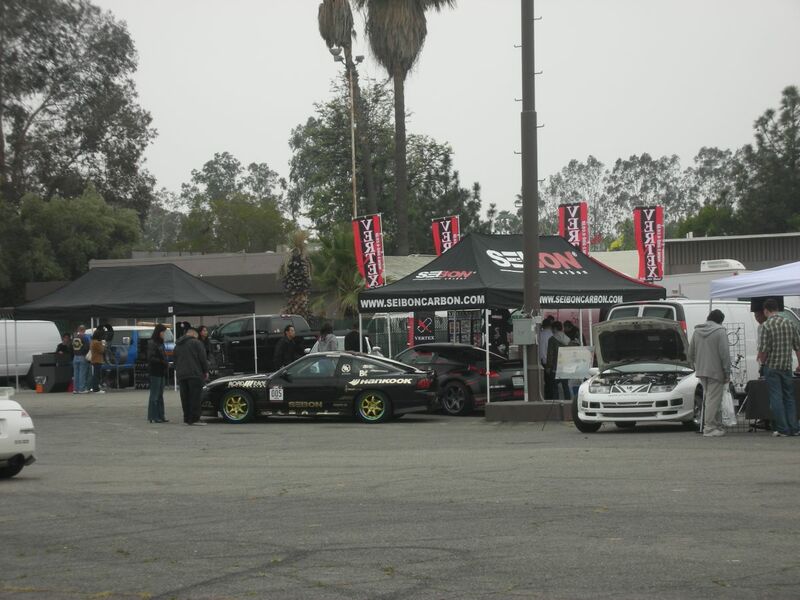 Here are some picture from Performance Nissan Show presented by HKS at the Orange Show Speedway on April 5th. 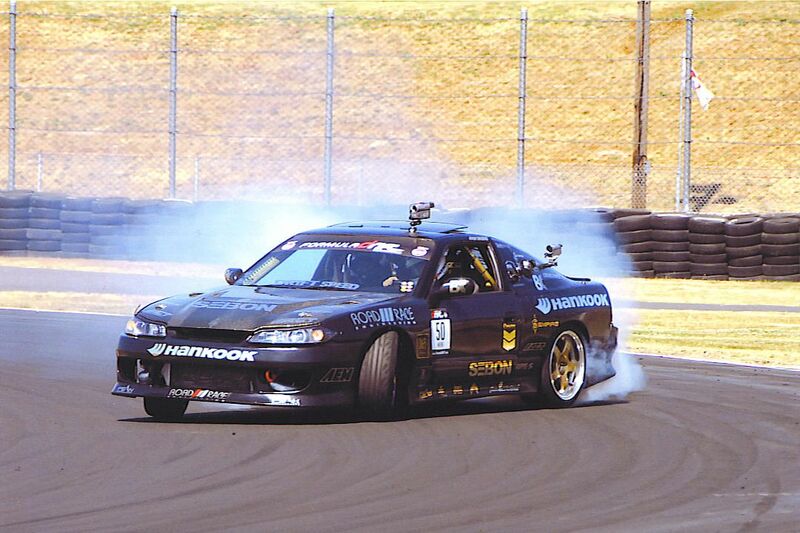 The RRE S13.5 was presented and was performing drift demos that day for Formula Drift. 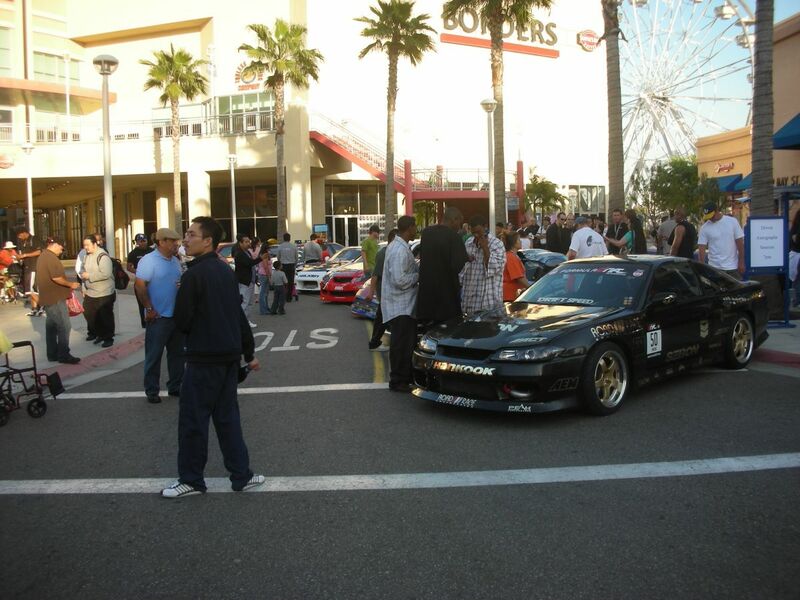 The other pictures are from this past weekend @ Formula Team Drift Competition. 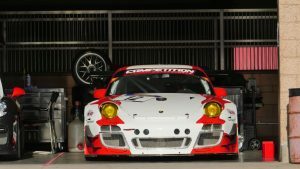 The RRE S13.5 was presented from April 16th through April 20th. 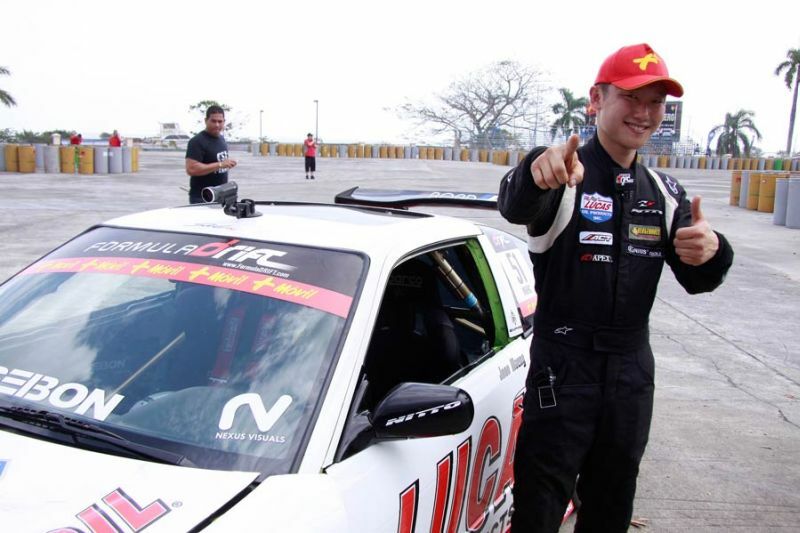 Joon had drift practice on Thursday until Saturday. Sunday was competition day. 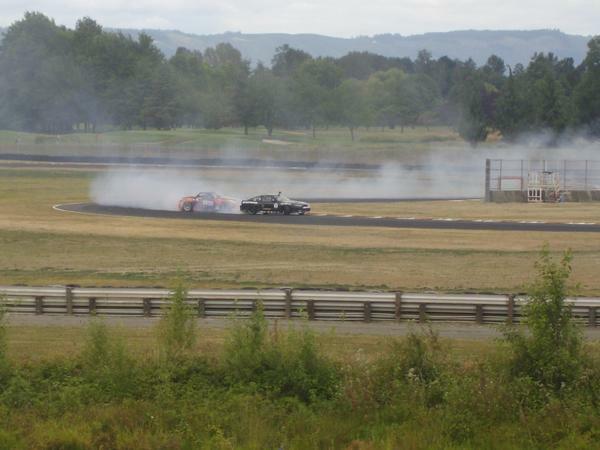 As a 3 car team for this competition, one of the car (Z33) was out because of mechanical failure. 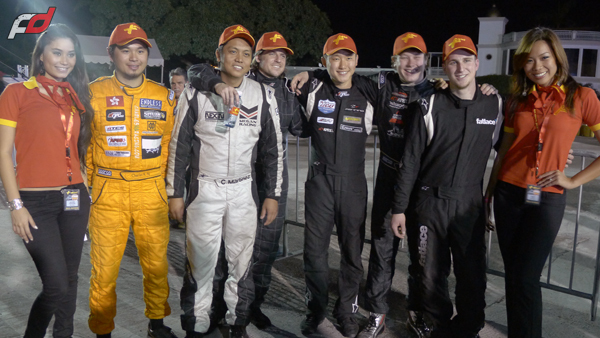 We did our best as a 2 car team, ( Robbie Nishida and Joon) but were deducted points for having only 2 cars. 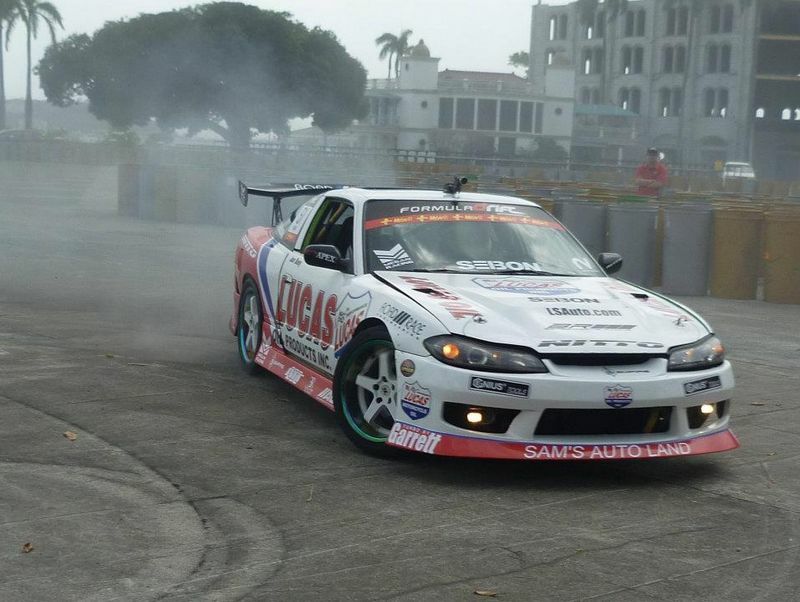 Joon passed the Formula Drift Pre Tech held at Super Autobacs. We displayed the vehicle from 9 A.M. -6 P.M. Here are some pictures. Back in the cold war era, the MX missile was the ultimate symbol of an in-your-face militant America that was ready to reign terror with a single, destructive blow on anyone that threatened our peaceful existence. While not quite as threatening as the thankfully dead ICBM, John Park’s ’93 Mazda MX-6 will still likely raze just about anything that gets in its way. Also, much like the silo-stored missiles of the ‘70s and ‘80s, Park’s MX-6 hides its important bits far from highly-critical public eye. 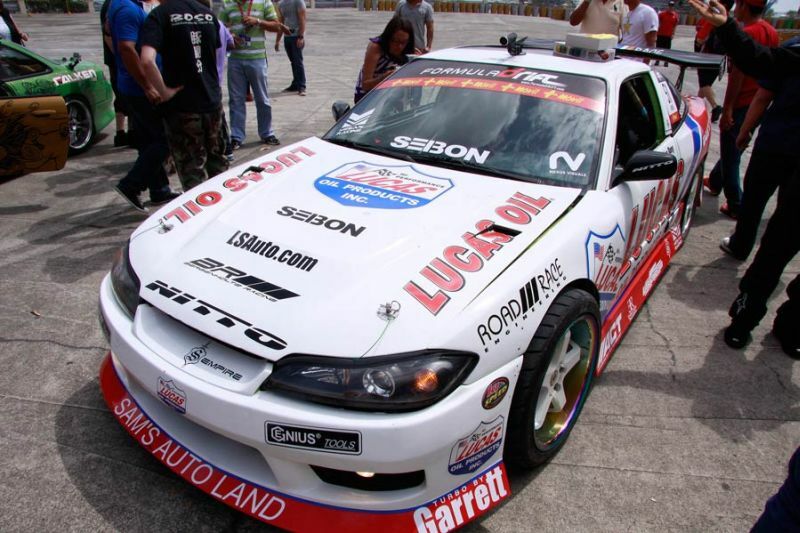 In fact, so secret was this car that it was kept from the hungry eyes of the aftermarket performance magazines since being built several years ago. 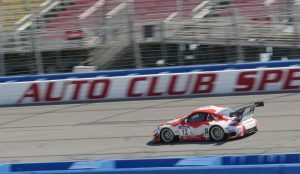 Park’s car was built to follow a specific concept, according to Mike Welch at Road/Race Engineering in Huntington Beach, Calif., who is mostly responsible for the car’s high output. The goal for the black MX-6 was to be as fast as possible without sacrificing the car’s stock driveability and durability. That means that Park’s MX-6 is still packing functional air conditioning, power steering and other accessories just as it came from the factory. 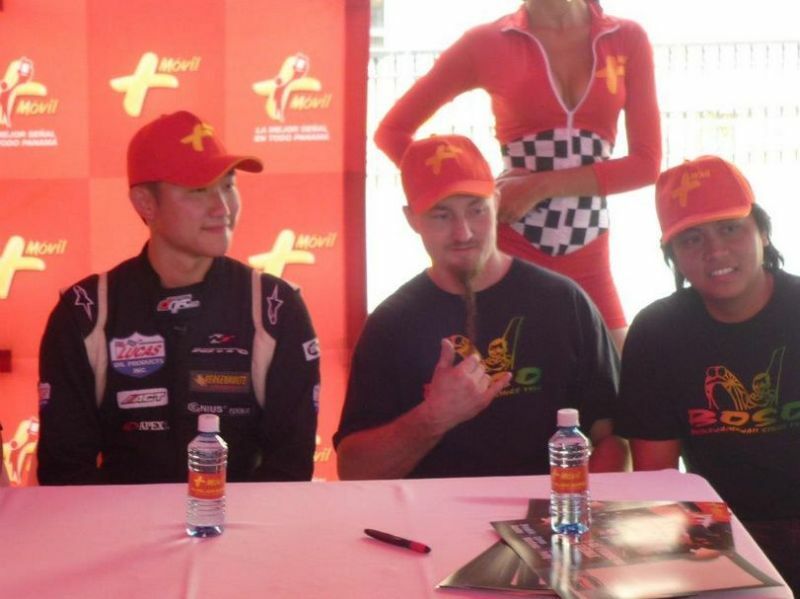 Park came to Welch wanting an advantage over most anything he might encounter at the stop light grand prix. 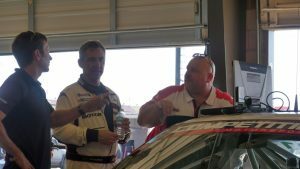 But, he wanted to be able to do the trouncing with three of his buddies in the car and the air conditioning blasting. 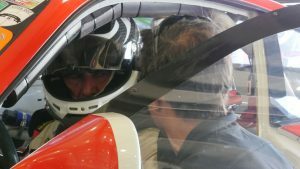 He also required that the car do all this without raising the eyebrows of anyone who looked under the hood; a tall order for a front-drive car that weighs more than 3,000 lbs. Countless hours of work in the form of custom design and fabrication went into transforming the MX-6 into the phenomenal machine that it is today Before installing the supercharger, Welch recommended that Park drive the car for about three months to break in the engine. The supercharger uses ceramic bearings and an internal belt drive. The belt and bearings last about 30,00 miles before needing a $450 rebuild, according to Welch. 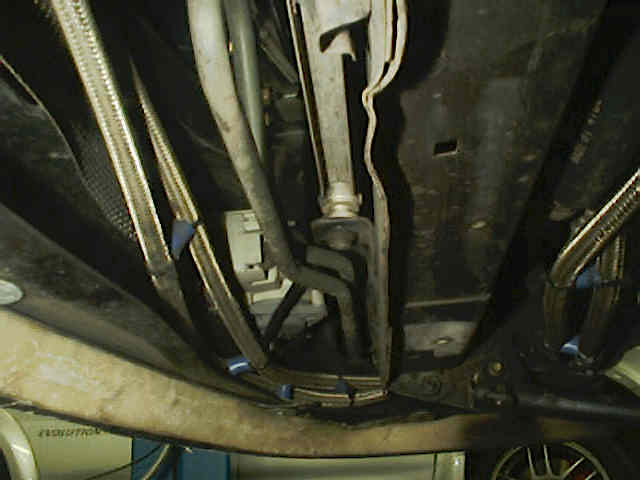 Otherwise, the system is relatively maintenance free, requiring only occasional lubrication and cleaning of the industrial bearings used to support the driveshaft. 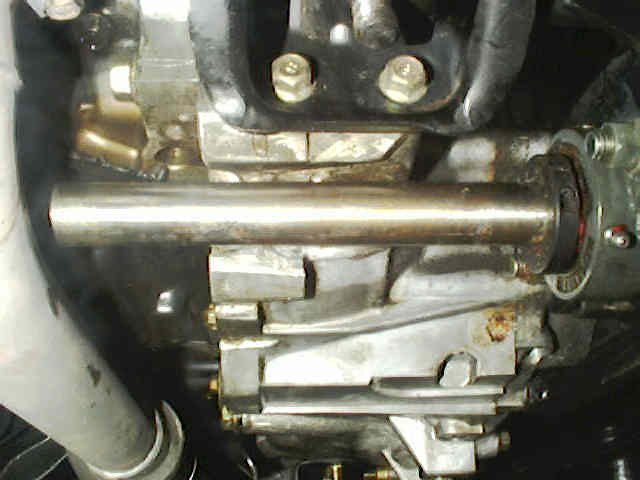 The shaft turns at 11,900 rpm at a maximum engine speed of 7000 rpm. 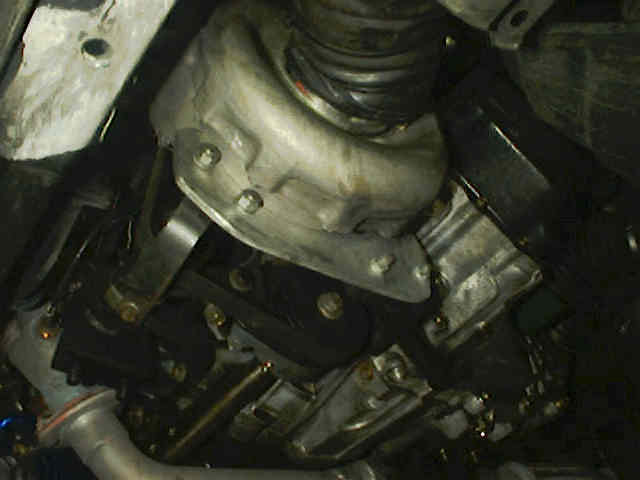 An aluminum skidplate was fabricated to protect the supercharger’s low-mounted drive system. The entire setup is practically invisible from the top of the engine bay as though the intake is routed below the car to collect cold air. 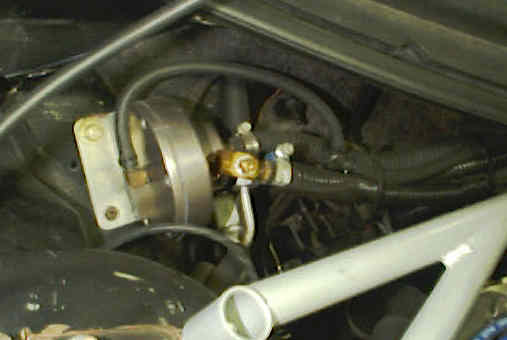 A UNI foam filter feeds the supercharger via a 3-inch hose, while a Bosch compressor bypass valve bleeds excess pressure. 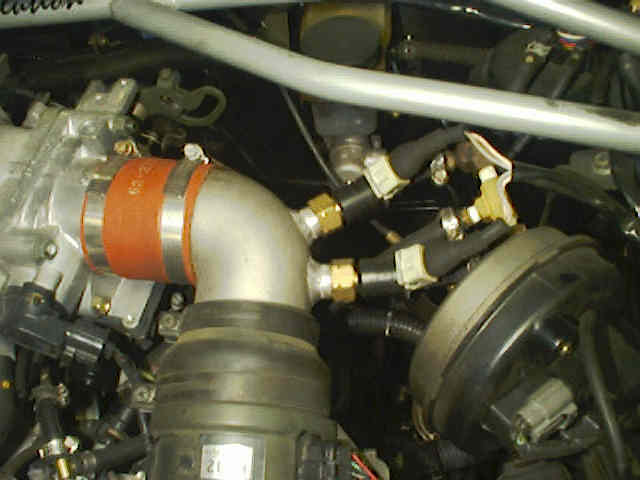 Additional fuel delivery is now accomplished via two HKS 550cc injectors installed just aft of the air flow meter before charged air enters the manifold. 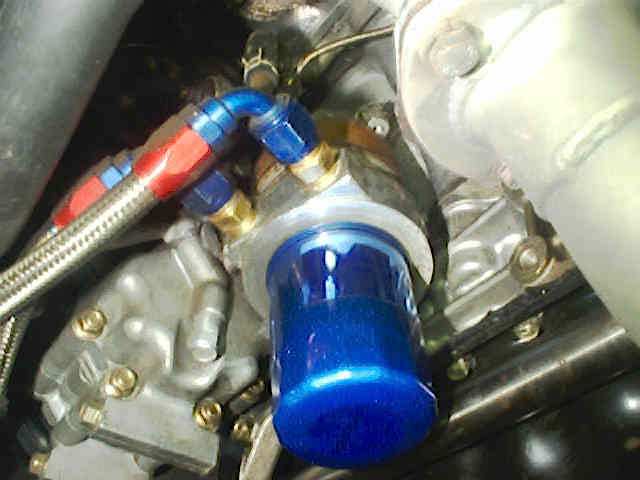 A rising rate fuel pressure regulator is used in conjunction with an HKS Additional Injector Controller allowing up to 12 psi boost. 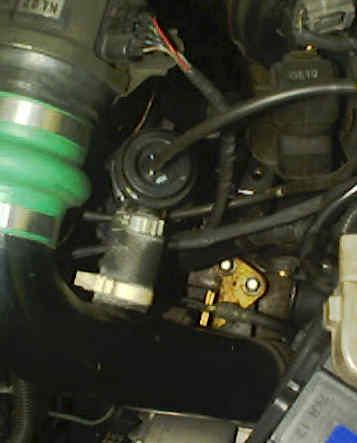 A Denso in-tank fuel pump maintains fuel pressure. 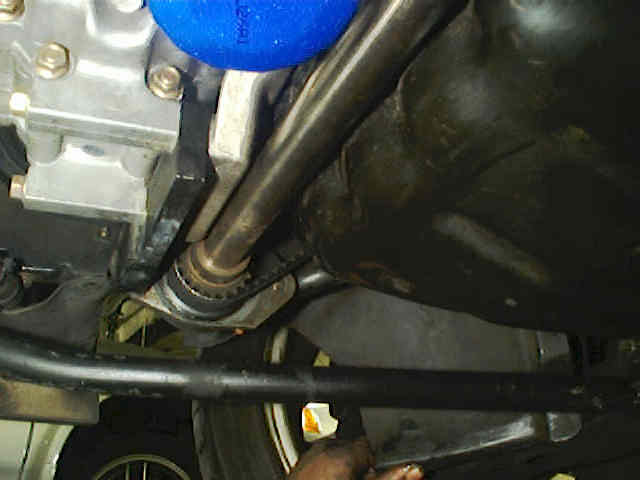 Hot Shot headers were used in place of the stock exhaust manifolds, while a Stromung 2.5-inch exhaust system takes the place of the less efficient stock system. The exhaust system also uses a 2.5-inch high-flow catalytic converter. 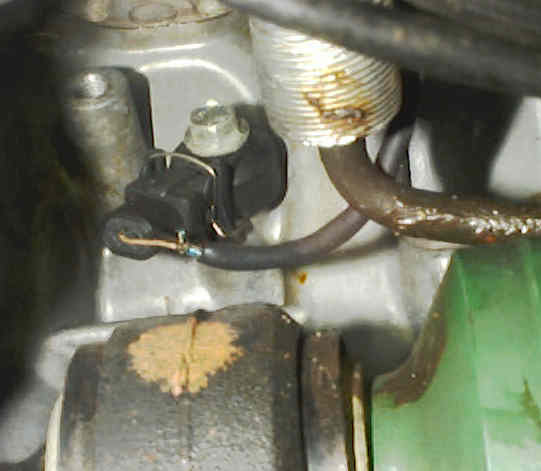 A J&S Electronics knock retard sensor was installed allowing Welch to advance the engine’s timing without fear of damage from detonation. The J&S unit retards timing on only the cylinders knocking. 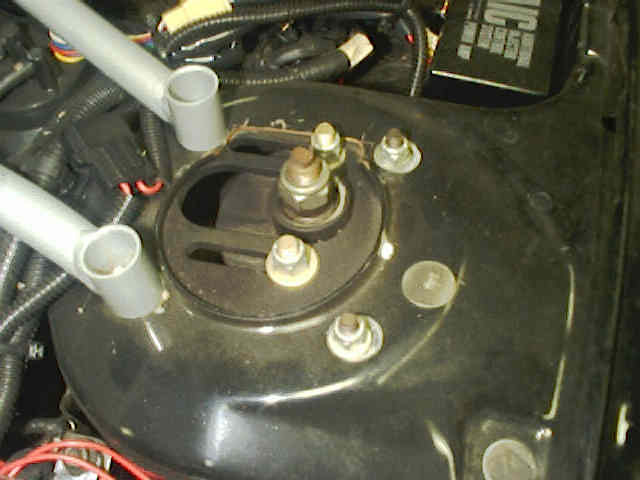 Installed in the cabin are a J&S air/fuel ratio meter and knock retard meter, allowing Park to keep an eye on the engine’s on-boost performance. 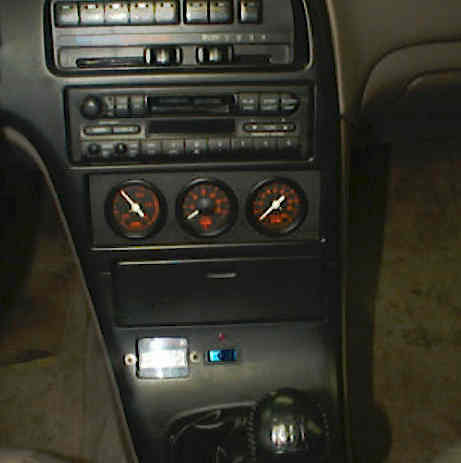 Also installed are HKS boost, exhaust gas temperature and oil temperature gauges. 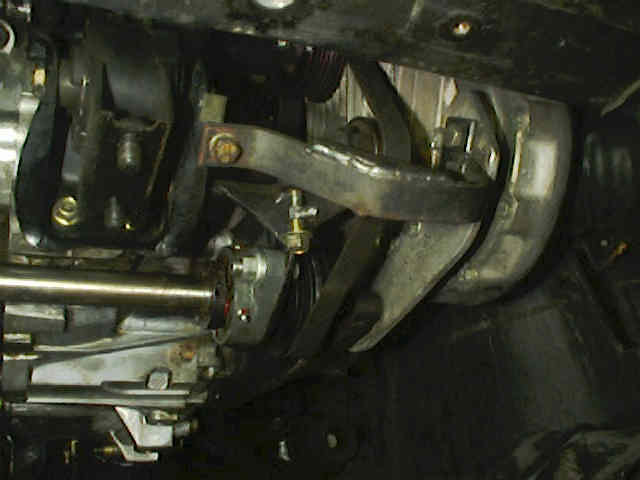 Stock suspension bits were replaced with adjustable Carrera threaded body coil over shocks, which allow the car’s ride height to be adjusted as needed. 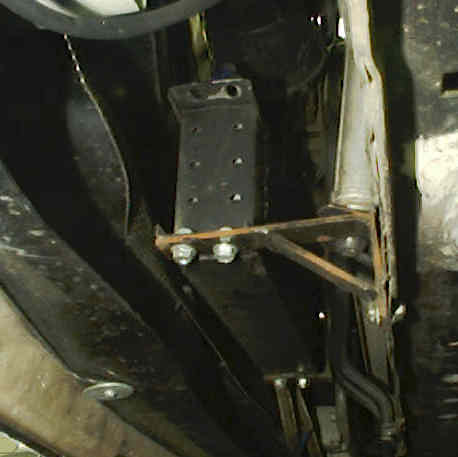 Road/Race also designed and built front and rear strut tower braces. The front shocks are a full 1 inch shorter than stock, requiring the use of custom camber plates from Road/Race. Welch also installed Power Slot rotors and Repco Metal Master brake pads. 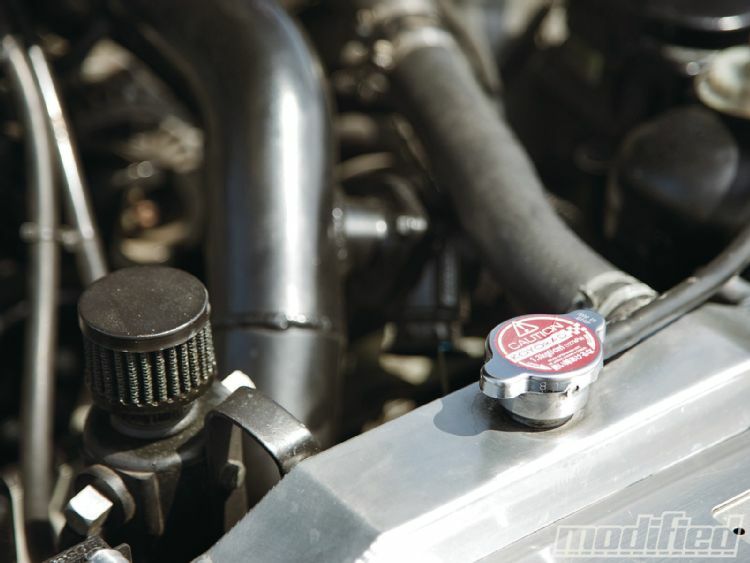 Steel braided brake lines are used with Motul brake fluid to enhance brake performance. 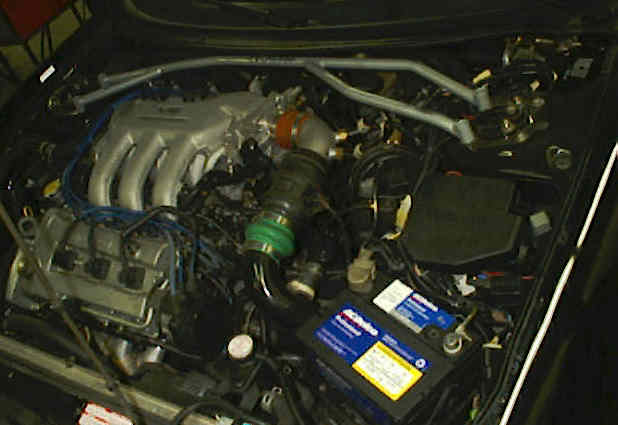 The final touches on Park’s MX-6 were cosmetic. Road/Race combined an aftermarket wing designed for an RX-7 and the stock wing from the MX-6 at the rear of the body eliminating the near-stock appearance of the MX-6. 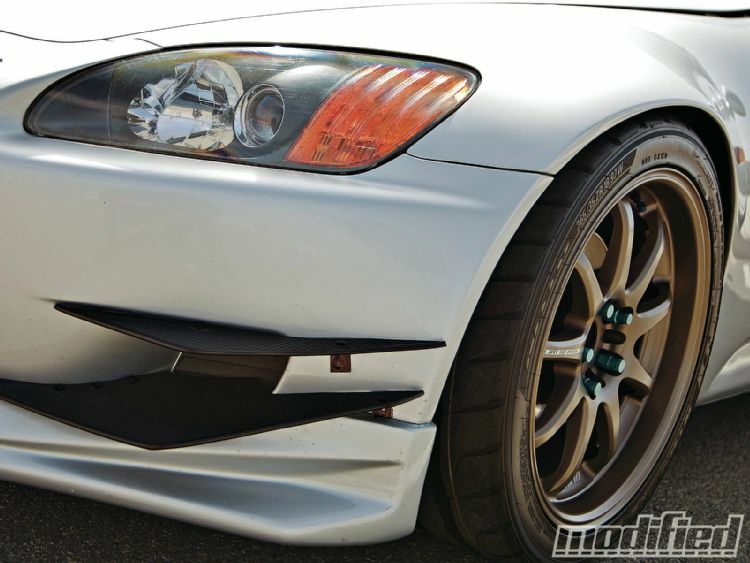 A Japanese Mazdaspeed front spoiler was adapted to fit the bumper of the American MX-6 to give the car a more aggressive stance, while all factory emblems and the trunk lock cylinder were shaved. Park chose 16×8-inch wheels from the third-generation RX-7 because of their light 13.5-lb weight. Although not as massive as the rolling stock found on many of today’s hot imports, the lightweight wheels serve their purpose well. Park had the wheels painted black to match the rest of the car. While the MX-6 has only been put through the quarter-mile once, its times aren’t likely representative of its substantial power increase. 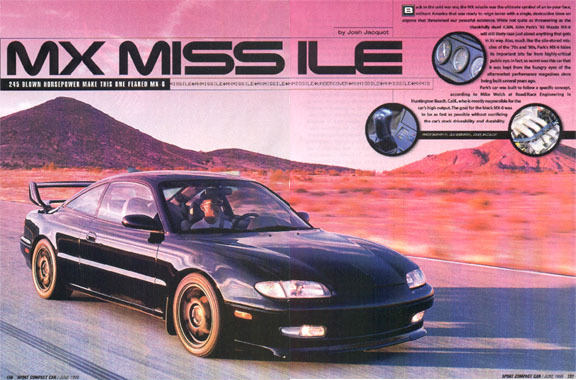 The MX-6 ran a 14.0-second quarter-mile on street tires with massive amounts of wheelspin, according to Park. Both the car’s owner and its builders believe it’s capable of much better time given the right tires. Park is considering selling the car now that his secret is out of the bag, we can’t wait to see his next stealthy screamer.